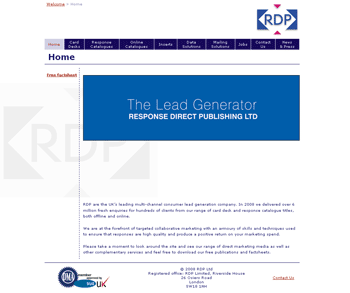 RDP provide a solution that they call "collaborative marketing". This means that their clients share the direct marketing costs with other companies. RDP help them to achieve that. In the coming year RDP will generate upwards of 4 million consumer enquiries through the direct media that they publish. This includes card decks, response catalogues and travel supplements. RDP has experienced tremendous growth over the last few years and has become the dominant force in consumer lead generation in the UK. To cope with this growth and the huge amounts of data that they process, RDP have chosen PRIAM Business Software as their solutions partner. Response data is imported into the PRIAM system, processed, and depending on certain criteria is then channelled out towards the company who has placed the advertisement. The PRIAM system is able to process huge volumes of data quickly and efficiently and without the need for high powered servers. The PRIAM database is able to hold many millions of records without the need to clear down or archive data and with no effect on speed of processing. Commenting on the implementation Glyn Carvill, PRIAM Commercial Director, said, "The successful implementation at RDP is testament to the flexibility of the PRIAM system. The ability to process and store large amounts of data is paramount to RDP and the success of this project. We would like to welcome RDP as a partner and look forward to a long and successful relationship". "We purchased the PRIAM system to automate our data collection processes and to provide a more efficient way of outputting data to our customers. We have installed and implemented to plan and within our target timescales. We are delighted with the performance of the PRIAM system and the help we received from the team at PRIAM." Peter Webb, Creative & Marketing Director, for RDP.